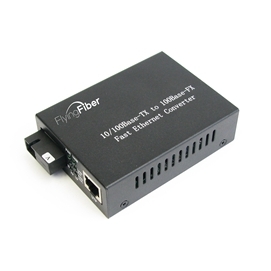 FlyingFiber’s 10/100M adaptive fast Ethernet optical media converter is used for optical transmission via high-speed Ethernet. It is capable of switching between twisted pair and optical and relaying across 10/100Base-TX and 100Base-Fx network segments, meeting long-distance, high-speed and high-broadband fast Ethernet work group users’ needs, achieving high-speed remote interconnection for up to 120 km’s relay-free computer data network. With steady and reliable performance, design in accordance with Ethernet standard and lightning protection, it is particularly applicable to a wide range of fields requiring a variety of broadband data network and high-reliability data transmission or dedicated IP data transfer network, such as telecommunication, cable television, railway, military, finance and securities, customs, civil aviation, shipping, power, water conservancy and oilfield etc, and is an ideal type of facility to build broadband campus network, cable TV and intelligent broadband FTTB/FTTH networks. 1). In accordance with Ethernet standards IEEE802.3, 10/100Base-TX and 100Base-FX. 7). 128 K’s data buffer RAM. 8). Support for low-delay time pure data transmission and full/half-duplex flow control. 9). Built-in watch-dog timer to monitor any error in internal data exchange. 1). For intranet prepared for expansion from 10M to 100M.